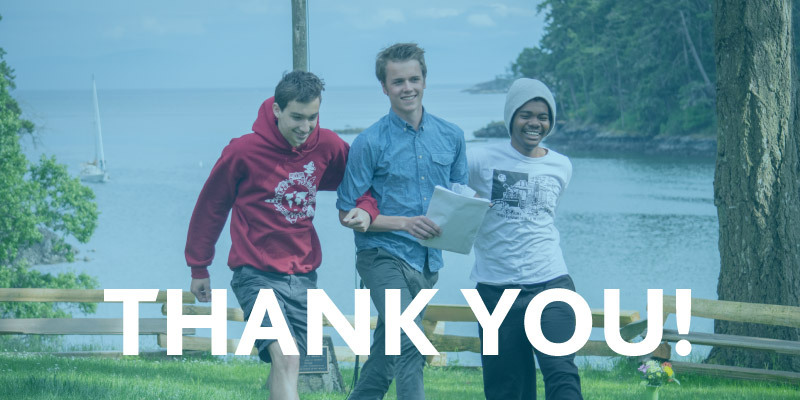 We appreciate each and every gift given to support our students – this place and this unique educational experience wouldn’t exist without this community of giving. Pearson College UWC’s Sustainer’s Society members play a special supporting role, making sure that we can count on their contributions year after year. This Society is made up of more than 600 donors who have pledged to give on a regular monthly, quarterly, or annual basis. Together, their gifts fund nearly seven and a half student scholarships each year! They make it possible for students like Hana from Indonesia and Graham from Canada to have this life-changing experience. Nearly 90% of our students require financial support to attend Pearson College, and these gifts to our Scholarship Fund create this opportunity. Having this strong base of support helps show the world how important this unique educational experience is and lends voice to our supporters’ commitment to helping Pearson continue its transformative mission. Regular giving ensures that our students receive the financial support they need and helps the College plan for the future. Please consider joining our Sustainer’s Society today! Graham, Hana, and their classmates are taking on the profound adventure of living and learning together. This year they are joined by nearly 200 students from every province and territory in Canada and 89 countries around the world, challenging and informing each other’s world views, and working collectively to create positive change. Each day these students embody the UWC mission of making education a force to unite people, nations, and cultures for peace and a sustainable future. The skills they develop and the connections they make at Pearson will give them a strong and enduring foundation as they continue their life-long changemaking journey. Hana is a second-year Pearson student from Indonesia, living on campus in East House with roommates from Saskatchewan, Ukraine, and eSwatini. 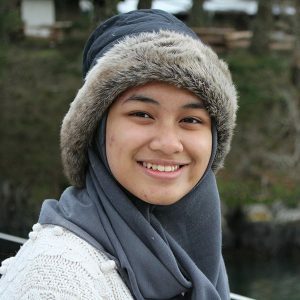 Known in the campus community for her enthusiasm, generosity, and intelligence, Hana takes every opportunity to engage with and learn from her peers from all regions of the world. She successfully balances an ambitious academic workload and leadership roles in the community, from researching the feasibility of tidal power in Indonesia to lending her beautiful voice to showcase a Javanese song in Pearson’s annual One World performance. Hana has a true passion for understanding how things work and finding ways to improve the world. She is learning to paddle an outrigger canoe, attends body combat fitness classes, and is a member of the campus restoration team. Graham is also a second-year Pearson student, joining us from Ontario, Canada. Insightful and creative, Graham has participated fully in the theatrical and musical programs at Pearson. He is a student Choir Leader this year and is a celebrated member of the new Pearson theatre troupe Right Circle, Left Cross, where students explore the use of theatre as a tool of social or political change. 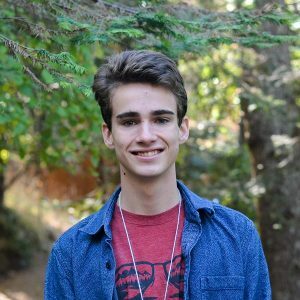 A Peer Supporter on campus, Graham helps fellow students deal with difficult emotional and mental health issues, leading student discussions on masculinity, drug use, and addiction. In this role, Graham has consistently demonstrated compassion, leadership, and a strong desire to foster positive change. Graham is known for being willing to speak up in large groups for important causes or marginalized individuals, and for his thoughtful and generous nature. Graham’s extended research project (which his supervisor termed “an outstanding piece of work,”) focuses on the Beijing Opera during the Chinese Cultural Revolution. As well as reflecting his artistic mindset, this project has piqued his interest in pursuing further studies in China. He is also an avid participant in Expedition Sailing and is much admired for his enthusiasm for the water, his curiosity regarding the dynamics of sailing, and his positive energy. Graham is striking an impressive balance between academics, creative expression, and community-mindedness.